Cairngorms Nature is an informal partnership open to all. It’s an opportunity for people and organisations from all backgrounds to come together with one thing in common: a love of the Cairngorms National Park's wildlife and the desire to do something to protect it. Through Cairngorms Nature we have a picture of what we want the National Park to look like in 50 years’ time. It’s a vision that’s shared by lots of different landowners and organisations. Conservation in the National Park is a collective effort, to make a truly exceptional place for wildlife it needs lots of different people working to the same goal. Read our vision to see if the National Park we’re describing looks like the one you want to see. Our Action Plan describes what we will be focussing on over the next five years. It sets out where we think action is most needed and what we’re going to do about it. The plan does not cover everything to do with biodiversity in the National Park, nor does it include everyone who is doing a great deal of valuable work. The four aims describe the priorities and the list of key partners identifies agencies and groups that will provide the drive and support. 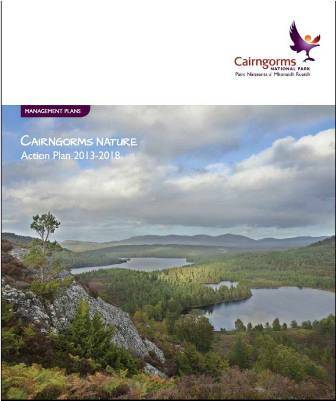 Cairngorms Nature is a new partnership, open to all who want to contribute. All it takes to be part of it is a desire and commitment to help deliver the Action Plan. The Action Plan describes where we want to be in five years, the partnership will get us there. Cairngorms Nature is steered by a strategy group made up of representatives from Dee Fisheries Trust, Forestry Commission Scotland, National Farmers Union Scotland, National Trust for Scotland, Royal Society for the Protection of Birds, Scottish Land and Estates, Scottish Gamekeepers’ Association, Scottish Natural Heritage, Cairngorms National Park Authority, Wildland Ltd and a Community Development Officer. Get in touch and make it yours.